Tanzanite is a variety of blue zoisite that was discovered in the Merelani District of Tanzania in 1967. It's compelling beauty immediately won over the hearts of everyone that laid eyes on it, and within a very short period of time developed a worldwide popularity. Tanzanite would not exist as we know it if it were not for heat treatment. When in its virgin state, pleochroic tanzanite appears an unimpressive yellowish brown in one of its crystallographic directions. When heated to between 800-900 degrees Fahrenheit, the brownish tones are removed and the gorgeous violet blue is intensified. This treatment is completely stable and permanent. 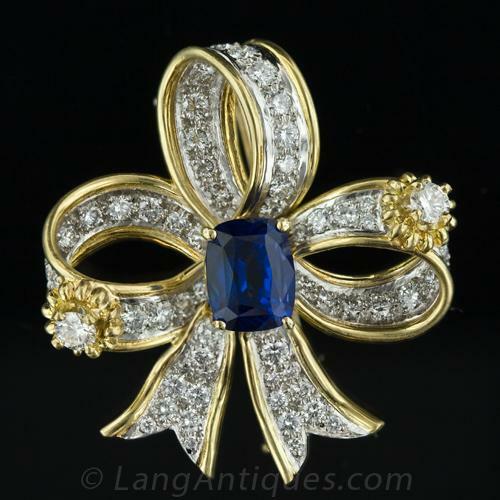 Tanzanite does not possess the hardness of the fine Kashmir sapphires it can resemble. It's hardness, around 6 1/2 on Moh's scale is closer to demantoid garnet and low zircon. Tanzanite was discovered by a tailor named Manuel D'Souza in the region of the Meralini Hills near Mount Kilimanjaro, approximately 90 kilometers from his home in Arusha. This sensational find received great publicity throughout the United States and Europe. This discovery was ill fated for D'Souza who was murdered in what was made to appear like a fatal car accident. His death temporarily halted the supply of tanzanite. The name "tanzanite" was bestowed on this gem by the director Henry Platt of Tiffany & Co., who felt the name much more marketable than zoisite. Tanzanite is a very limited resource. It is only found in a six-kilometer strip in the Meralani Hills, which was divided into four blocks, labeled A, B, C and D. Block C is the only site still commercially producing rough tanzanite at this time. In October 2002, Tanzanite was added to the official birthstone list by the American Gem Trade Association as an additional birthstone for December. The Tanzanite Foundation, in their campaign: BE BORN TO TANZANITE, TM, is also promoting tanzanite as "The Gem of Birth". Inspired by the tradition of Masai women giving blue beads to new mothers, in an attempt to bestow a healthy and positive life on the newborn, The Tanzanite Foundation suggests that the custom be replaced in the western world, by giving Tanzanite when a baby is born. Tanzanite is a recent discovery, so it has little metaphysical history. Its color associates it with the throat, crown and third eye chakras. It fosters both communication and psychic powers. Similar Stones: Tanzanite can be confused with sapphire, spinel, amethyst and a synthetic variety of the mineral forsterite.